Earlier this month, the televised news media broadcast images of a student protest against higher tuition fees in Britain that included an attack on members of the British royal family. 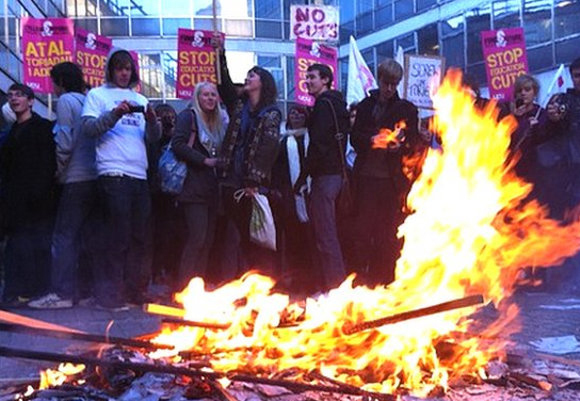 The British protest is one of several ongoing protests worldwide against higher tuition fees at government-run post-secondary educational institutions. France and Greece have also been rocked by public-sector protests against reductions in government expenditures. Most governments worldwide have for years subsidized post-secondary education in their efforts to create highly educated segments of their populations to assure robust and productive economies. The spending spree of the government of Iceland essentially bankrupted their national economy. The governments of Greece, Ireland, Spain and Portugal now face the reality of having to curtail government spending to save their national economies and avoid the economic meltdowns of Iceland or Zimbabwe. They believed that government spending on public works projects such as infrastructure development would stimulate and sustain economic growth. They now face the reality that such action neither creates wealth nor does it stimulate a national economy out of a downturn, let alone assure and sustain long-term economic growth. Several European governments now face an economic event that parallels what occurred in America, when the stock market collapsed in 1920. The government of the day cut expenses and kept itself out the economy as the Federal Reserve curtailed the printing of new currency. By the end of 1921, the American economy had recovered. Job losses, or rather lay-offs, were short-term compared to the long-term job losses and the loss of the manufacturing sector that are occurring today in the USA, the result of massive government spending and massive printing of new currency. There may be some hope for economic recovery if various European governments were to follow the example of the US administration of 1920 and 1921. Massive government spending that prevailed across much of Western Europe has a parallel in the high-tech sector of the 1990s. Easy availability of government funding fuelled a boom in the high-tech sector and caused wages and prices to escalate in numerous parts of that sector. Price escalations indicated possible areas of new business opportunity, but the massive influx of easy funding had generated misleading and distorted market signals. A massive number of companies responded to the misleading market signals by developing new products and services aimed at enhancing the productivity of the end users. The result was the high-tech meltdown and dot-com bust. Subsequent attempts by the US Federal Reserve to restart the stalled high-tech sector through an infusion of new funding had no effect. The American government continues to spend and their Federal Reserve prints excess new paper currency as the American economy stumbles and falters. Printing excess currency may lower the value of the dollar against other currencies. Proponents of this policy claim that it offers American industry the opportunity to create new jobs by exporting goods and services into foreign markets. However, a previous round of excess printing of American currency led to the high-tech meltdown, the dot-com bust, the mortgage meltdown and the collapse and bankruptcy of the American automobile manufacturing industry. One area of the economy that has attracted political favour and was supposed to have created massive numbers of new high-paying jobs was the green-tech sector that involves clean, renewable energy. But most of the contemporary green-tech sector technologies such as wind power and photovoltaic solar energy requires massive amounts of government subsidies and/or higher electric power prices. Higher electric power prices reduce consumer spending and can cause related job losses in remote areas of the economy. Government investment in the green energy sector and related subsidies may actually result in a transfer of jobs within the greater economy. A gain of 2 high-paying green sector jobs may result in a loss of 3 or 4 lower-paying jobs in other less visible and even invisible sectors of the greater economy. Despite Spain having invested more heavily in their green-tech energy sector than other European nations, their youth unemployment rate stands at over 40%, an indication that massive government spending in the green-tech sector may not necessarily translate into an abundance of new jobs for a nation's youth. "The unwillingness of the American administration to reduce spending and reduce the excess printing of new currency may be politically motivated. America's economy requires a major market correction to liquidate the malinvestment that exists." Many nations including the USA have growing numbers of university-educated citizens who cannot find full-time, long-term employment in fields where they can apply their education. Recent statistical data reveals that some 5000 doctorate level graduates are employed as janitors. Over 300,000 waiters and waitresses along with some 175,000 parking lot attendants have completed a college level education. The stark reality in many Western and European nations is that achieving a college or university level education can no longer guarantee professional level employment. Hundreds of thousands of students across the USA and Canada, who pursue higher level education using government loans, graduate from college and university with massive debts that take years and decades to repay on non-professional salaries. A large segment of the population, including well-educated people, who are unemployed or underemployed and unable to repay their student loans may be a formula for future social unrest. The recent student protests in the UK along with public-sector personnel protesting impending reductions in government expenditures in Greece and France indicate a possible trend for the future. The unwillingness of the American administration to reduce spending and reduce the excess printing of new currency may be politically motivated. America's economy requires a major market correction to liquidate the malinvestment that exists. However, such a market correction may be too unpalatable for elected officials to contemplate. Despite the existence of a precedent from 1920 and 1921 in American economic history that could resolve America's economic problems, an administration seeking to avoid massive loss of public support will pay it no heed. A period of prolonged economic stagnation followed by price inflation caused by the excessive printing of paper currency could result in political and social upheavals occurring more slowly during a period of hyper-stagflation. During such a period, masses of people may have to undertake peaceful and constructive action in an unofficial economy, similar to that of India, to assure their survival. The medium of exchange may be bartering or the use of local currencies in highly localized markets. The economic policies of India's government failed to create massive numbers of jobs for the employable segment of India's population. India's unofficial or underground economy came to the rescue of millions of people by providing them with the means to eke out a living. America's economic and fiscal policies of recent years may be leading it down a path not so dissimilar from India's during a period of hyper-stagflation in the North American economy.